Elisabeth and Josh were married on a gorgeous summer day in June. A rustic feel with a comfortable, relaxed style characterized the wedding. Hermitage Hill Farm and Stables provided the beautiful backdrop of the Blue Ridge Mountains and the charming reception space. Ward Photography captured all of the lovely details. Elisabeth carried an asymmetric, loose bouquet of ivory and pink. We used “Patience” and “Quicksand” roses, “Majolica” spray roses, rosemary, dusty miller, pink ranunculus, and silver dollar eucalyptus. The stems were tied with an ivory satin ribbon and pinned with pearls. The groomsmen wore unique boutonnieres that reflected the style and setting of the wedding. Baby’s breath, pink astrantia, and sprigs of lavender were arranged in shotgun shells, tied with an ivory ribbon. For the ceremony, we placed hanging glass, hobnail mason jar arrangements along the aisle. A combination of white hydrangea, pink and ivory roses, blush delphinium, astrantia, and greenery filled each jar. The reception centerpieces were varied and created an air of rustic elegance. Tourterelle lanterns topped with lush greenery and loose arrangements in mason jars were placed atop natural wooden slabs. Vintage mercury glass votives and green moss circled the centerpieces. Thank you to Elisabeth and Josh for allowing us to be a part of their special day! Also, thank you to all of the amazing vendors for making this wedding so spectacular! To see more, visit the Ward Photography blog, or our Weddings page. Exciting News! 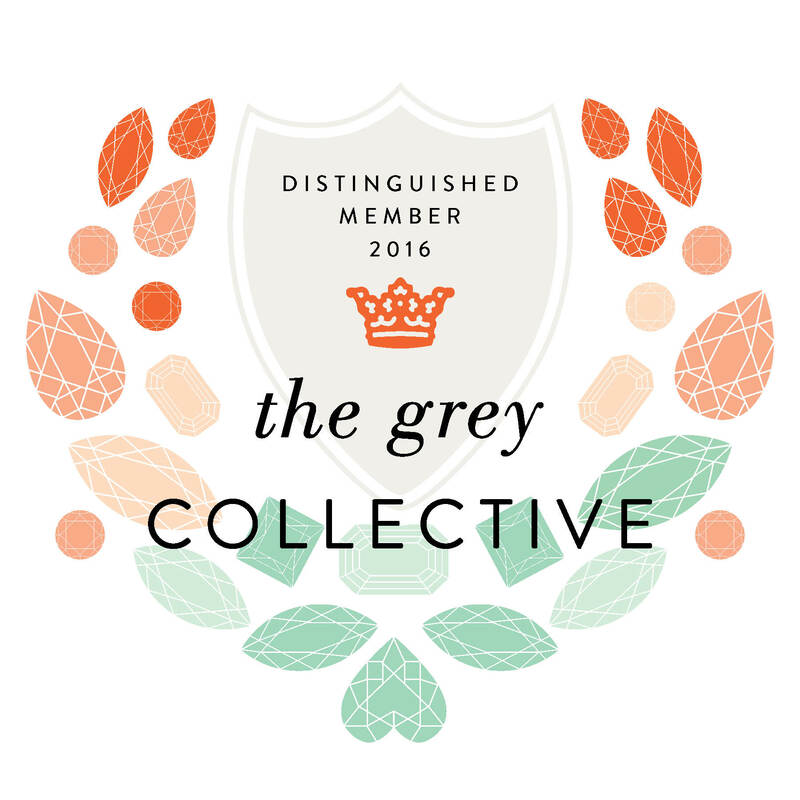 We are now a member of the Grey Collective on Grey Likes Weddings! Visit our profile here. Volume 8 of the Scout Guide Charlottesville is out and available at our shop, Foods of all Nations, and online! We love how our spread turned out. With the gorgeous setting of Swannanoa Palace, and the brilliant photography of Stacey Evans, we couldn’t get a bad shot. The Scout is Out Party to celebrate the new issue was a blast, and we were so happy to contribute to the celebration with our work. Our arrangements reflected the new cover colors, pink and brown, and were an exciting accent to the celebration. Thank you to our wonderful friends at The Scout Guide, and here’s to Volume 8! Lauren and Tom were married on a gorgeous spring day in May. The event was held in Trump Winery’s Grand Hall, with the ceremony taking place outside overlooking the venue’s stunning grounds. Planned by Cinda Hoege of White Birch Events, the event exuded sophistication and personal charm. The color scheme of navy blue, white, and gold was complemented with florals in white, blush, fuschia, and green. The bride carried a simple and full bouquet of cream florals, with pops of color. Peonies, white tulips with raspberry edging, peach garden roses, anemones, camellia leaves, and umbrella ferns were tied together with an ivory ribbon and cascading bow. Lauren’s bridesmaids wore long navy dresses and carried bouquets similar to the bride’s, though smaller in scale. The groomsmen wore boutonnieres of “Hot Majolica” spray roses, tied with a thin champagne ribbon. The groom’s boutonniere was unique, composed of a raspberry peony bud and seeded eucalyptus. For the ceremony, we placed a lush green garland of salal and silver dollar eucalyptus down the length of the aisle. Woven in and out of the garland were our large and small Tourterelle lanterns. Table arrangements for the reception consisted of cream hydrangea, “combo” roses, stock, champagne lisianthus, and raspberry spray roses. Gold-leafed cube containers were used to complement the table settings, and mercury glass votives added a romantic lighting to the room. At the head table, a long garland runner was placed down the length of the table, and interspersed were mercury votives and the bridesmaids’ bouquets. Our gold candelabras were also used for centerpieces. Thank you to Aaron Watson Photography for the stunning shots and to all of the other vendors who made this day possible! To see more of this wedding, visit our Weddings page or browse the gallery below. Maggie and James’s early spring wedding at Pippin Hill was absolutely breathtaking, and an amazing kick-off to the busy wedding season. The celebration and the stunning photographs by Katelyn James Photography were recently published on the Grey Likes Weddings blog (linked here)! Below we have shared some more information on the florals and design for the event. The bride carried a full, romantic bouquet of soft pinks and blush. Our flower choices were David Austin roses, cream hydrangea, white spray roses, ranunculus, and anemones. Delicate greenery of seeded eucalyptus, dusty miller, and fern was added for texture and interest. The stems were wrapped with cream satin ribbon and pinned with pearls. Maggie’s bridesmaids carried bouquets of blush and ivory to complement their gowns. “Pink Finesse” roses, white majolica spray roses, dusty miller, lisianthus, camellia leaf, and blush hypericum berries were tied together in champagne ribbon and pinned with pearls. Our Tourterelle birch bark arbor was used for the altar. We embellished it with cream hydrangea, blush roses, jasmine vine, stock, camellia leaf and magnolia branches. Hanging glass mason jars filled with hydrangea, roses, stock, ivy, and camellia were used as aisle markers. For the reception, the focal point was a suspended ladder wrapped in greenery, branches, and florals. This central farm table featured a garland runner with gold mercury glass votives scattered along it. Lush arrangements of pinks, creams, and yellows were the centerpieces for the guest tables. We loved the creativity and design that went into the florals for this wedding! It was a joy to be a part of this special day and to work with all of the fabulous vendors, including the Girls from Main Street event planners. Congrats to Maggie and James! To see more from this wedding, visit our Weddings page or Grey Likes Weddings.